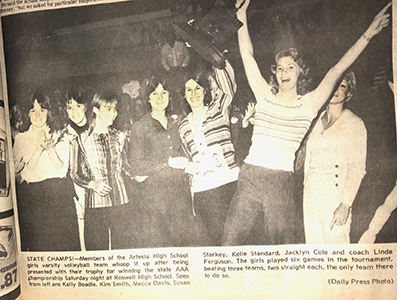 Looking back 40, 30 and 20 years ago, the following are excerpts from the Artesia Daily Press from Nov. 12-18. The New Mexico Military Institute Colts made their first mistake of the night Friday when they went down the wrong ramp onto the field for their pregame warm-up. They used the Bulldogs’ ramp, and when informed of this, coach Mike Phipps told his players about this gross error. It may or may not have had any effect, since Artesia would up its season with a 48-0 thumping of the Colts, putting the Bulldogs at 7-3 on the year and sending the Colts back to Roswell with an 0-11 season. As reported in the Pinon News: Charles Tosh of Belen and Mrs. Harold Martin of Alamogordo feel they were very lucky as they killed their turkey. Mr. and Mrs. Tosh planned to freeze Charlie’s turkey and keep it for Thanksgiving. Several deer were seen on cars going out Sunday afternoon. Representing North Eddy County at a recent two-day March of Dimes regional meeting in Denver were Dawn Eickhoff, Frances Currier and Dianna Calvert. North Eddy County’s March of Dimes unit received an award for raising more money per capita than any other full county in the region. Lake Arthur area rancher Hazel H. Mills received an award as Outstanding Conservation Farmer in the Central Valley Resource Development District from Gary Anderson of the Soil Conservation Service. Mills moved to Cottonwood from Arkansas in 1931 and began his present farm in 1942. He became a cooperator in the Central Valley district in 1948. “I feel it is very important to do what I can to conserve the soil and water,” Mills said. Three members of the girls’ volleyball team were presented with trophies at the Appreciation Dinner held by the Artesia Parents and Boosters Club. Winners were Kelly Beadle (Best Defensive Player), Jacklyn Cole (Most Valuable Player) and Susan Starkey (Best Offensive Player). As reported in the Pinon News: The Game Department reported the best hunting in the state was in this area, but all the hunters some of the ranchers talked to said the report was they had seen some does and fawns, but only two bucks were seen going out, and the hunters were very disappointed. Luis Aguilar proudly displayed home-grown sweet potatoes that weighed in at more than two pounds apiece. He sells the produce, which comes from his garden at Ninth Street and Mahone Drive, to area residents, but he plans to keep these for his own Thanksgiving dinner. The secret of his green thumb: tilling the ground deep before planting and keeping the soil loose throughout the growing season. Gary Ekberg with the Artesia Balloon Club told Artesia city councilors Tuesday that the club would no longer be involved with the Artesia Balloonfest. Ekberg said that due to a lack of support from the Artesia Chamber of Commerce, Artesia Lodgers’ Tax and not enough volunteers, the club was withdrawing from the Balloonfest. The Lubbock Christian University Chaparrals, who have won the National Association of Inter-collegiate Athletics national championship in cross country since 1990, will seek to improve their record to eight straight NAIA national titles Nov. 15 in Kenosha, Wisc. Marcos Morillon of Artesia is one of the top runners for the Chaparrals. The second season is upon us. No, not the changing of the weather from summer to fall. The other season, the one that will probably kick off at Bulldog Bowl Saturday. Yes, the high school football team’s pursuit of the Class 3A state title. Make no mistake. The Bulldogs will be ready to go come Saturday. And they have their eyes on the prize but are not looking past the quarterfinal round. Artesia Desk & Derrick Club honored members during their annual appreciation night. Nancy Jorren, who has represented the club on a local, regional and international level, was named Member of the Year. Mack Chase, who was recognized for his monetary and moral support of the local club even before his own employees became members and his annual $20,000 donation to scholarships, was named Boss of the Year. Chase currently has six employees who are members of Artesia Desk & Derrick. As reported in the Pinon News: Ms. Oza Holcomb was in Roswell, and Mr. and Mrs. Pete Peters of Artesia, went to a place and bought hamburgers and met Mrs. Holcomb for lunch, and visited with her much to her delight. Mrs. Peters came to Roswell to get her hair cut. They have been friends for several years and visit together and visit quite often. They come to the mountains quite often to go on picnics to the higher mountains and at the right time of the year, they go higher in the mountains and go hunting for fruit to store for winter use or can or jelly.